Clear photos of wild mountain lions are pretty rare. Crystal clear photos of an entire family — a mother and her two cubs — are unprecedented. These cute little guys live in the Santa Monica Mountains above Los Angeles. Warning: There's photos of animals eating another animal below, as they really do in the real world. If that scares you, we suggest you turn your computer off, go inside and lock your doors. New photos of P-19 and her two nearly-grown kittens, P-32 and P-33, feeding on a deer carcass. Kittens normally stay with their mother until they are about one to one and a half years old. One of the siblings, P-34, had already dispersed and it appears that these kittens may have also left their mom since the photos were taken in mid-February. This is P-19's second litter and we've been tracking all three kittens since they were four weeks old. 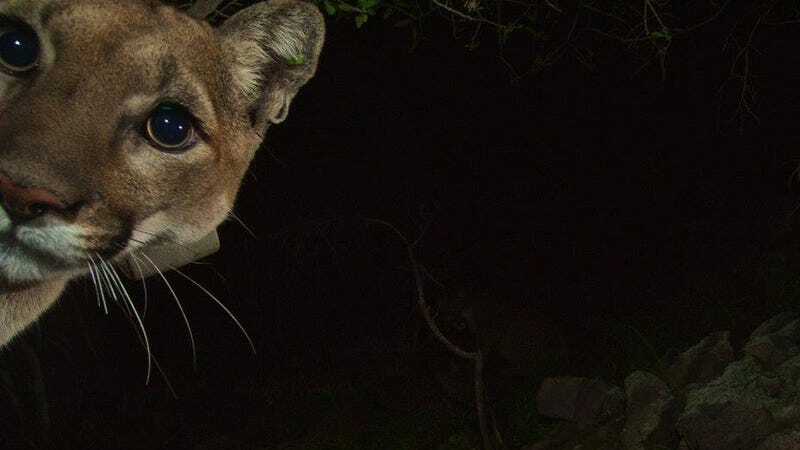 Since we started studying these animals in 2002, we have not tracked any male mountain lions that have successfully dispersed out of the Santa Monica Mountains. Photos taken via remote camera on the western end of the Santa Monica Mountains, near the L.A. and Ventura County line. "Trail" or remote cameras like the ones here are dispersed in areas through which animals are likely to travel and typically use motion sensors to detect the presence of animals and activate the camera. They're digital, but they do make some small noises while they work and fire a flash at night; as you can see here, the lions detected the presence of the camera and investigated it. These are some photogenic creatures. "P" stands for Puma and the animals are numbered sequentially in the order tracking them began, which started in the LA area in 2002. Paternity tests have shown that the cubs' dad is likely P-12, the first lion ever seen to successfully cross the 101 freeway in LA county. Unfortunately, LA's lion population is tiny, but is still too highly populated for the natural space available here. That creates two major problems for the species: 1) these little guys are the product of inbreeding. P-12 is also the father of their mother. 2) Lions require relatively large ranges and defend their own from incursion by other members of their species. As these lions mature, they face interspecies killing if they don't disperse far enough. And they'll need to cross busy freeways to do that. P-32 is a male lion, while Ps 33 and 34 are females. They were found and had blood samples drawn in November, 2013, shortly after their birth. Lacking the necessary funding, the Park Service was unable to fit them with radio implants for detailed tracking. While the trail cameras they're using instead are a poor substitute for researchers, they do at least give us these incredible images. Their mom, P-19, is wearing a radio tracker and so researchers are able to identify her kill sites and install trail cams in them to study the cubs while they're still traveling with their mother. The hope was budget would become available for capturing and fitting trackers to the cubs before they left their mother, but P-34 is already known to have dispersed and its thought the other siblings likely have now too. Wary creatures, these are likely the last photos we'll ever see of them.